SPX: A very interesting week! : the market closed on Friday where it closed last Friday. The SPX completed an impulsive wave from the low at 1029 at 1114 near the 50% fibonacci retracement of Primary [A] on Monday. I count this five wave impulse as a wave (a) of [v] of an Expanding Ending Diagonal. 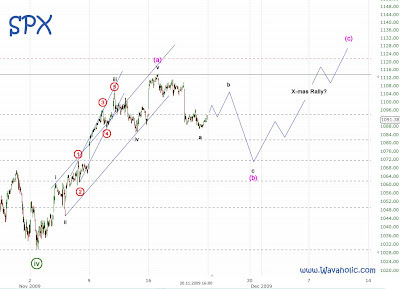 Thus wave (b) is now underway with a target at 1070ish. After that the market should climb to new highs around X-mas or a bit earlier to complete the Expanding Ending Diagonal. A drop below 1029 would invalidate all the short and intermediate term bullish counts and actually nearly confirm that Primary [C] is underway. Furthermore it would match my fractal I posted last weekend. Elliott Wave Update Week 45 2009 ~ Spot on!